We just cut all of the leaves off today, but I'm worried that we're too late to save my Sunflowers. They were doing so well. The second photo shows a massive infestation of sucking bugs. 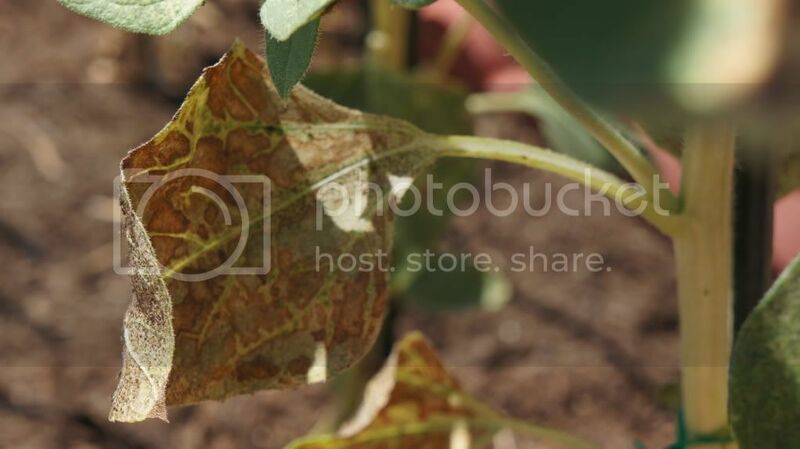 If every leaf is covered, I'm afraid the plant just got sucked dry. As soon as you see something like that, start by spraying them off with water. if you are not squeamish, simply smear/squish the bugs with your hands. I use sudsy hands (just plain soap -- I prefer Dr.Bronners or gentle glycerin soap) to just put foam on WET leaves and then rinse off with water from the garden hose. If you maintain a chemical-free garden, usualy by the time this level of infestation occurs, predatory beneficial insects will be at work to decimate them. So be sure to examine the bugs closely and determin friend or foe. You don't want to kill off the good guys. 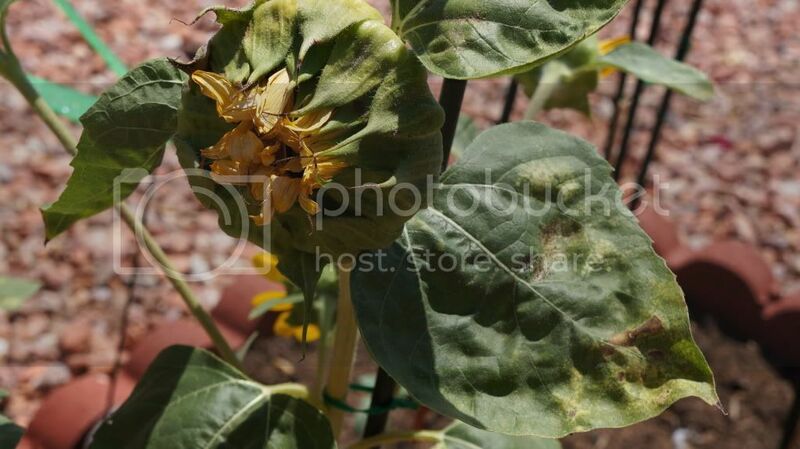 Often the sucking insects spreads disease, so there might be secondary health issues going on with your sunflowers at this point as well, but I can't say for sure. 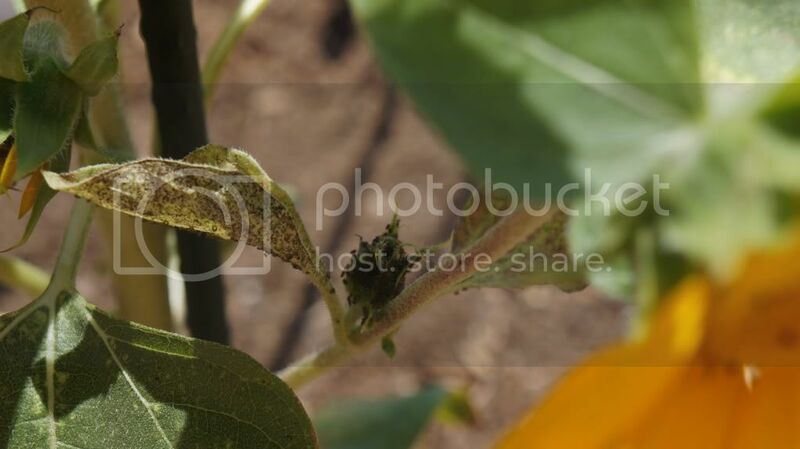 applestar wrote: The second photo shows a massive infestation of sucking bugs. 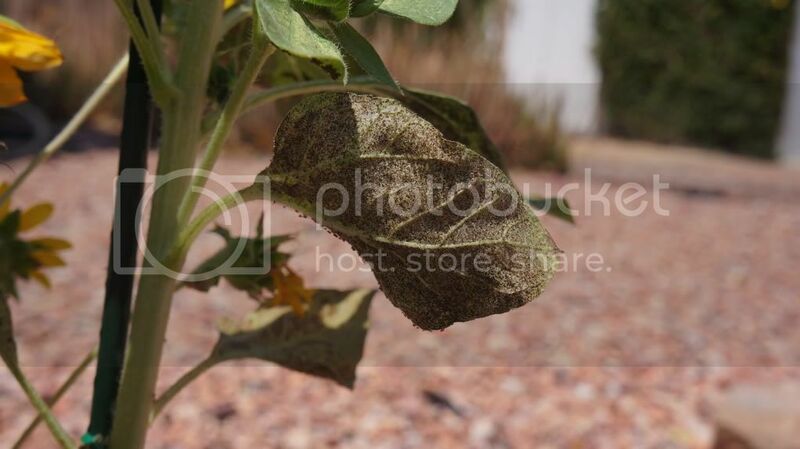 If every leaf is covered, I'm afraid the plant just got sucked dry. As soon as you see something like that, start by spraying them off with water. if you are not squeamish, simply smear/squish the bugs with your hands. I use sudsy hands (just plain soap -- I prefer Dr.Bronners or gentle glycerin soap) to just put foam on WET leaves and then rinse off with water from the garden hose. You cant defend yourself against these sucking bugs without chemisty. My apples were attacked once and I tried to fight them naturaly, but with no success. 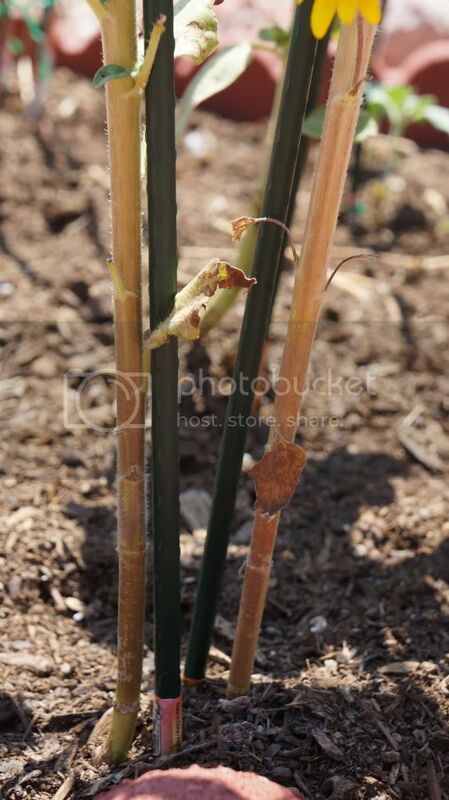 The next year I have spreyed them for prevention and no one has shown. "no one" including the beneficials. A black and yellow garden spider has made a giant web on my apple tree -- I had to refrain from completing the summer pruning around the web so as not to break it. It's so convenient now with so much information readily available so as to make an informed choice. What has had some success is putting a half dozen of the bugs n a blender with water and strain for a spray on you plants. You can spray them and what seems to happen is it attracts preditory bugs and brings out a disease in the body of the infested bugs. Its almost like a disease that affects only the bug that the spray is made from! Sometimes a companion plant may deter the bugs. I ever had any problem with my sunflowers! My Sunflowers Only Last A Few Days, What's Wrong? Did I plant my Sunflowers too soon?